For the past year I've picked up more than a few Strange Chemistry titles featuring strong heroines, mature and strengthened by their independence. 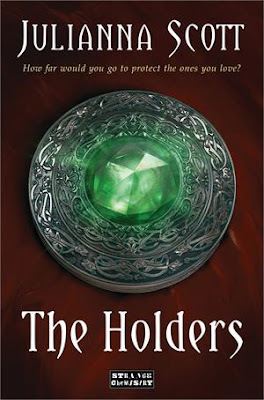 Without a doubt, Julianna Scott's The Holders is no exception! When I first began reading I had high expectations to be thoroughly intrigued, but I didn't expect the urge Scott's writing built in me to read furiously until the end. I fell for the characters, the plot, and the beautiful presentation of Ireland. Rebecca Ingle, 17 years old and self-charged with protecting her younger brother, Ryland, is a force to reckon with. Scott opens the novel showcasing the most admirable trait that any character can have and Becca has loads of: fierce loyalty. The voice she's created for young Becca is honest and strong; even when she's afraid of change or danger she still comes across as real. I thought it was extremely interesting how her rage, which could be considered a flawed trait in certain scenes, was perfect because it came out in her protective streak over the ones she loved. The voices Ryland hears in his head have alienated him and made him the target of several offers to be locked up in mental facilities. Becca is completely against them all until her family is approached by representatives from a school in Ireland. Alex Bray convinces her that her brother is special and that the voices he hears are a sign of his emerging power. St. Brigid's Academy becomes a beacon for Ryland who may finally find the help he deserves. Becca tags along in hopes that she can be there for Ryland until he settles down and to make sure he's truly safe. The transition reveals the truth about why Ryland is special for a Holder and what his role is in a centuries old prophecy. The Holders could remind readers of X-Men, or even Kate Kaynak's Minder, but the fantasy elements are just a touch more intricate. Not to mention the fact that the Holders race began after regular humans were blessed by an Irish goddess many centuries ago. The idea of humans with superpowers is nothing new, but it's the little things about the Holders' society and control of power that sets Scott apart from the rest. I am so thankful this is only the beginning of a series because I couldn't imagine not being able to read a continuation of Becca's story. The Holders is a novel too entertaining and emotionally charged to pass up!